While walling this, I made sure the left corner is empty so the impression of Hijikata is missing *ehem* so damn much can be portrayed. Ah, the emptiness, it hurts. >__< Nothing much was added to the wall except the vector, a little texture, some brushings, layer adjustments and filters. Love the sepia+sunset melancholy look. *hearts* I tried to paint the colours inside the outlines of Hijikata with the mouse, and I find the result doesn't look all too bad. :) In fact, I kinda love this one. Note: *ehem* is a spoiler. XD I'll just leave this at that. Hijikata illustration - cover for "Rikka", a Gintama doujinshi (c) Nagisa (PLUG). 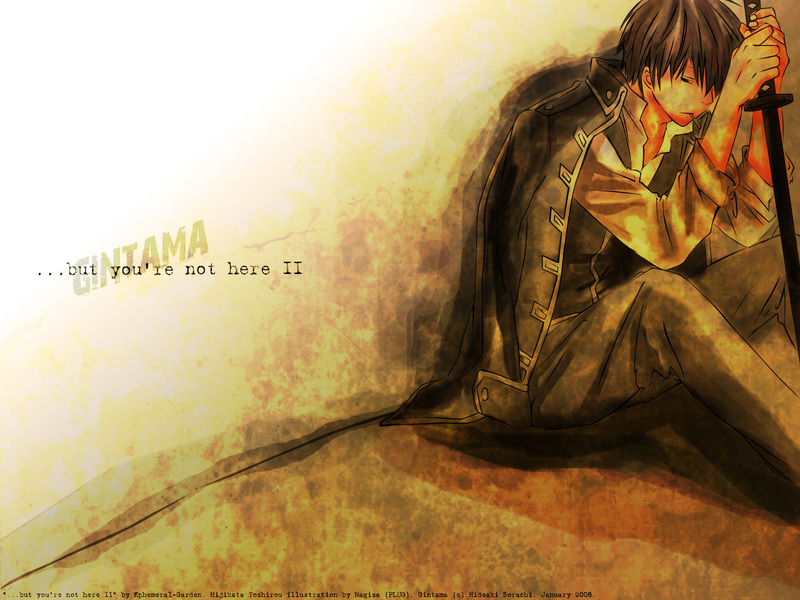 Hijikata Toshirou of Gintama (c) Sorachi Hideaki. ...but you're not here II painted scan. The wall is excellent...that word says it all! I've been watching this anime so much lately- Hijikata is so awesome. My second favourite character (to Gin-chan of course). I especially like the simplicity of it.